Charles Dickens Biography : CHAPTER I. BIOGRAPHY OF CHARLES DICKENS: CHAPTER I. Education is a kind of lottery in which there are good and evil chances, and some men draw blanks and other men draw prizes. And in saying this I do not use the word education in any restricted sense, as applying exclusively to the course of study in school or college; nor certainly, when I speak of prizes, am I thinking of scholarships, exhibitions, fellowships. By education I mean the whole set of circumstances which go to mould a man's character during the apprentice years of his life; and I call that a prize when those circumstances have been such as to develop the man's powers to the utmost, and to fit him to do best that of which he is best capable. Looked at in this way, Charles Dickens' education, however untoward and unpromising it may often have seemed while in the process, must really be pronounced a prize of value quite inestimable. His father, John Dickens, held a clerkship in the Navy Pay Office, and was employed in the Portsmouth Dockyard when little Charles first came into the world, at Landport, in Portsea, on February 7, 1812. Wealth can never have been one of the familiar friends of the household, nor plenty have always sat at its board. Charles had one elder sister, and six other brothers and sisters were afterwards added to the family; and with eight children, and successive removals from Portsmouth to London, and London to Chatham, and no more than the pay of a Government clerk--pay which not long afterwards dwindled to a pension,--even a better domestic financier than the elder Dickens might have found some difficulty in facing his liabilities. It was unquestionably into a tottering house that the child was born, and among its ruins that he was nurtured. But through all these early years I can do nothing better than take him for my guide, and walk as it were in his companionship. Perhaps no novelist ever had a keener feeling of the pathos of childhood than Dickens, or understood more fully how real and overwhelming are its sorrows. No one, too, has entered more sympathetically into its ways. And of the child and boy that he himself had once been, he was wont to think very tenderly and very often. Again and again in his writings he reverts to the scenes and incidents and emotions of his earlier days. Sometimes he goes back to his young life directly, speaking as of himself. More often he goes back to it indirectly, placing imaginary children and boys in the position he had once occupied. Thus it is almost possible, by judiciously selecting from his works, and using such keys as we possess, to construct as it were a kind of autobiography. Nor, if we make due allowance for the great writer's tendency to idealize the past, and intensify its humorous and pathetic aspects, need we at all fear that the self-written story of his life should convey a false impression. He was but two years old when his father left Portsea for London, and but four when a second migration took the family to Chatham. Here we catch our first glimpse of him, in his own word-painting, as a "very queer small boy," a small boy who was sickly and delicate, and could take but little part in the rougher sports of his school companions, but read much, as sickly boys will--read the novels of the older novelists in a "blessed little room," a kind of palace of enchantment, where "'Roderick Random,' 'Peregrine Pickle,' 'Humphrey Clinker,' 'Tom Jones,' 'The Vicar of Wakefield,' 'Don Quixote, 'Gil Blas,' and 'Robinson Crusoe,' came out, a glorious host, to keep him company." 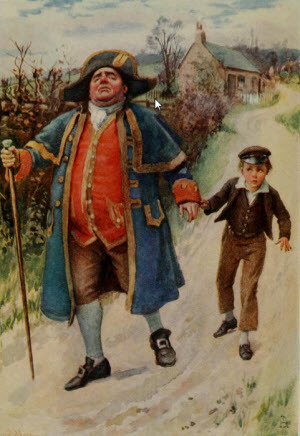 And the queer small boy had read Shakespeare's "Henry IV.," too, and knew all about Falstaff's robbery of the travellers at Gad's Hill, on the rising ground between Rochester and Gravesend, and all about mad Prince Henry's pranks; and, what was more, he had determined that when he came to be a man, and had made his way in the world, he should own the house called Gad's Hill Place, with the old associations of its site, and its pleasant outlook over Rochester and over the low-lying levels by the Thames. Was that a child's dream? The man's tenacity and steadfast strength of purpose turned it into fact. The house became the home of his later life. It was there that he died. But death was a long way forward in those old Chatham days; nor, as the time slipped by, and his father's pecuniary embarrassments began to thicken, and make the forward ways of life more dark and difficult, could the purchase of Gad's Hill Place have seemed much less remote. There is one of Dickens' works which was his own special favourite, the most cherished, as he tells us, among the offspring of his brain. That work is "David Copperfield." Nor can there be much difficulty in discovering why it occupied such an exceptional position in "his heart of hearts;" for in its pages he had enshrined the deepest memories of his own childhood and youth. Like David Copperfield, he had known what it was to be a poor, neglected lad, set to rough, uncongenial work, with no more than a mechanic's surroundings and outlook, and having to fend for himself in the miry ways of the great city. Like David Copperfield, he had formed a very early acquaintance with debts and duns, and been initiated into the mysteries and sad expedients of shabby poverty. Like David Copperfield, he had been made free of the interior of a debtor's prison. Poor lad, he was not much more than ten or eleven years old when he left Chatham, with all the charms that were ever after to live so brightly in his recollection,--the gay military pageantry, the swarming dockyard, the shifting sailor life, the delightful walks in the surrounding country, the enchanted room, tenanted by the first fairy day-dreams of his genius, the day-school, where the master had already formed a good opinion of his parts, giving him Goldsmith's "Bee" as a keepsake. This pleasant land he left for a dingy house in a dingy London suburb, with squalor for companionship, no teaching but the teaching of the streets, and all around and above him the depressing hideous atmosphere of debt. With what inimitable humour and pathos has he told the story of these darkest days! Substitute John Dickens for Mr. Micawber, and Mrs. Dickens for Mrs. Micawber, and make David Copperfield a son of Mr. Micawber, a kind of elder Wilkins, and let little Charles Dickens be that son--and then you will have a record, true in every essential respect, of the child's life at this period. "Poor Mrs. Micawber! she said she had tried to exert herself; and so, I have no doubt, she had. The centre of the street door was perfectly covered with a great brass-plate, on which was engraved 'Mrs. Micawber's Boarding Establishment for Young Ladies;' but I never found that any young lady had ever been to school there; or that any young lady ever came, or proposed to come; or that the least preparation was ever made to receive any young lady. The only visitors I ever saw or heard of were creditors. They used to come at all hours, and some of them were quite ferocious." Even such a plate, bearing the inscription, Mrs. Dickens's Establishment, ornamented the door of a house in Gower Street North, where the family had hoped, by some desperate effort, to retrieve its ruined fortunes. Even so did the pupils refuse the educational advantages offered to them, though little Charles went from door to door in the neighbourhood, carrying hither and thither the most alluring circulars. Even thus was the place besieged by assiduous and angry duns. 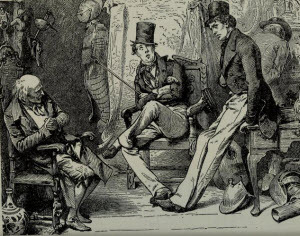 And when, in the ordinary course of such sad stories, Mr. Dickens is arrested for debt, and carried off to the Marshalsea prison, he moralizes over the event in precisely the same strain as Mr. Micawber, using, indeed, the very same words, and calls on his son, with many tears, "to take warning by the Marshalsea, and to observe that if a man had twenty pounds a year, and spent nineteen pounds nineteen shillings and sixpence, he would be happy; but that a shilling spent the other way would make him wretched." The son was taking note of other things besides these moral apothegms, and reproduced, in after days, with a quite marvellous detail and fidelity, all the incidents of his father's incarceration. Probably, too, he was beginning, as children will, almost unconsciously, to form some estimate of his father's character. And a very queer study in human nature that must have been, giving Dickens, when once he had mastered it, a most exceptional insight into the ways of impecuniosity. 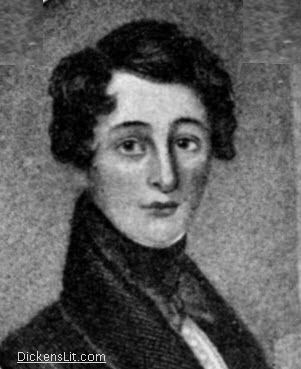 Charles Lamb, as we all remember, divided mankind into two races, the mighty race of the borrowers, and the mean race of the lenders; and expatiated, with a whimsical and charming eloquence, upon the greatness of one Bigod, who had been as a king among those who by process of loan obtain possession of other people's money. Shift the line of division a little, so that instead of separating borrowers and lenders, it separates those who pay their debts from those who do not pay them, and then Dickens the elder may succeed to something of Bigod's kingship. He was of the great race of debtors, possessing especially that ideal quality of mind on which Lamb laid such stress. Imagination played the very mischief with him. He had evidently little grasp of fact, and moved in a kind of haze, through which all clear outlines would show blurred and unreal. Sometimes--most often, perhaps--that haze would be irradiated with sanguine visionary hopes and expectations. Sometimes it would be fitfully darkened with all the horrors of despair. But whether in gloom or gleam, the realities of his position would be lost. He never, certainly, contracted a debt which he did not mean honourably to pay. But either he had never possessed the faculty of forming a just estimate of future possibilities, or else, through the indulgence of what may be called a vague habit of thought, he had lost the power of seeing things as they are. Thus all his excellencies and good gifts were neutralized at this time, so far as his family were concerned, and went for practically nothing. He was, according to his son's testimony, full of industry, most conscientious in the discharge of any business, unwearying in loving patience and solicitude when those bound to him by blood or friendship were ill or in trouble, "as kind-hearted and generous a man as ever lived in the world." Yet as debts accumulated, and accommodation bills shed their baleful shadow on his life, and duns grew many and furious, he became altogether immersed in mean money troubles, and suffered the son who was to shed such lustre on his name to remain for a time without the means of learning, and to sink first into a little household drudge, and then into a mere warehouse boy. So little Charles, aged from eleven to twelve, first blacked boots, and minded the younger children, and ran messages, and effected the family purchases--which can have been no pleasant task in the then state of the family credit,--and made very close acquaintance with the inside of the pawnbrokers' shops, and with the purchasers of second-hand books, disposing, among other things, of the little store of books he loved so well; and then, when his father was imprisoned, ran more messages hither and thither, and shed many childish tears in his father's company--the father doubtless regarding the tears as a tribute to his eloquence, though, heaven knows, there were other things to cry over besides his sonorous periods. After which a connection, James Lamert by name, who had lived with the family before they moved from Camden Town to Gower Street, and was manager of a worm-eaten, rat-riddled blacking business, near old Hungerford Market, offered to employ the lad, on a salary of some six shillings a week, or thereabouts. The duties which commanded these high emoluments consisted of the tying up and labelling of blacking pots. At first Charles, in consideration probably of his relationship to the manager, was allowed to do his tying, clipping, and pasting in the counting-house. But soon this arrangement fell through, as it naturally would, and he descended to the companionship of the other lads, similarly employed, in the warehouse below. They were not bad boys, and one of them, who bore the name of Bob Fagin, was very kind to the poor little better-nurtured outcast, once, in a sudden attack of illness, applying hot blacking-bottles to his side with much tenderness. But, of course, they were rough and quite uncultured, and the sensitive, bookish, imaginative child felt that there was something uncongenial and degrading in being compelled to associate with them. Nor, though he had already sufficient strength of character to learn to do his work well, did he ever regard the work itself as anything but unsuitable, and almost discreditable. Indeed it may be doubted whether the iron of that time did not unduly rankle and fester as it entered into his soul, and whether the scar caused by the wound was altogether quite honourable. He seems to have felt, in connection with his early employment in a warehouse, a sense of shame such as would be more fittingly associated with the commission of an unworthy act. That he should not have habitually referred to the subject in after life, may readily be understood. But why he should have kept unbroken silence about it for long years, even with his wife, even with so very close a friend as Forster, is less clear. And in the terms used, when the revelation was finally made to Forster, there has always, I confess, appeared to me to be a tone of exaggeration. "My whole nature," he says, "was so penetrated with grief and humiliation, ... that even now, famous and caressed and happy, I often forget in my dreams that I have a dear wife and children; even that I am a man, and wander desolately back to that time of my life." And again: "From that hour until this, at which I write, no word of that part of my childhood, which I have now gladly brought to a close, has passed my lips to any human being.... I have never, until I now impart it to this paper, in any burst of confidence with any one, my own wife not excepted, raised the curtain I then dropped, thank God." Great part, perhaps the greatest part, of Dickens' success as a writer, came from the sympathy and power with which he showed how the lower walks of life no less than the higher are often fringed with beauty. I have never been able to entirely divest myself of a slight feeling of the incongruous in reading what he wrote about the warehouse episode in his career. At first, when he began his daily toil at the blacking business, some poor dregs of family life were left to the child. His father was at the Marshalsea. But his mother and brothers and sisters were, to use his own words, "still encamped, with a young servant girl from Chatham workhouse, in the two parlours in the emptied house in Gower Street North." And there he lived with them, in much "hugger-mugger," merely taking his humble midday meal in nomadic fashion, on his own account. Soon, however, his position became even more forlorn. The paternal creditors proved insatiable. The gipsy home in Gower Street had to be broken up. Mrs. Dickens and the children went to live at the Marshalsea. Little Charles was placed under the roof--it cannot be called under the care--of a "reduced old lady," dwelling in Camden Town, who must have been a clever and prophetic old lady if she anticipated that her diminutive lodger would one day give her a kind of indirect unenviable immortality by making her figure, under the name of "Mrs. Pipchin," in "Dombey and Son." Here the boy seems to have been left almost entirely to his own devices. He spent his Sundays in the prison, and, to the best of his recollection, his lodgings at "Mrs. Pipchin's" were paid for. Otherwise, he "found himself," in childish fashion, out of the six or seven weekly shillings, breakfasting on two pennyworth of bread and milk, and supping on a penny loaf and a bit of cheese, and dining hither and thither, as his boy's appetite dictated--now, sensibly enough, on à la mode beef or a saveloy; then, less sensibly, on pudding; and anon not dining at all, the wherewithal having been expended on some morning treat of cheap stale pastry. But are not all these things, the lad's shifts and expedients, his sorrows and despair, his visits to the public-house, where the kindly publican's wife stoops down to kiss the pathetic little face--are they not all written in "David Copperfield"? And if so be that I have a reader unacquainted with that peerless book, can I do better than recommend him, or her, to study therein the story of Dickens' life at this particular time? At last the child's solitude and sorrows seem to have grown unbearable. His fortitude broke down. One Sunday night he appealed to his father, with many tears, on the subject, not of his employment, which he seems to have accepted at the time manfully, but of his forlornness and isolation. The father's kind, thoughtless heart was touched. A back attic was found for Charles near the Marshalsea, at Lant Street, in the Borough--where Bob Sawyer, it will be remembered, afterwards invited Mr. Pickwick to that disastrous party. The boy moved into his new quarters with the same feeling of elation as if he had been entering a palace. The change naturally brought him more fully into the prison circle. He used to breakfast there every morning, before going to the warehouse, and would spend the larger portion of his spare time among the inmates. Nor do Mr. Dickens and his family, and Charles, who is to us the family's most important member, appear to have been relatively at all uncomfortable while under the shadow of the Marshalsea. There is in "David Copperfield" a passage of inimitable humour, where Mr. Micawber, enlarging on the pleasures of imprisonment for debt, apostrophizes the King's Bench Prison as being the place "where, for the first time in many revolving years, the overwhelming pressure of pecuniary liabilities was not proclaimed from day to day, by importunate voices declining to vacate the passage; where there was no knocker on the door for any creditor to appeal to; where personal service of process was not required, and detainers were lodged merely at the gate." There is a similar passage in "Little Dorrit," where the tipsy medical practitioner of the Marshalsea comforts Mr. Dorrit in his affliction by saying: "We are quiet here; we don't get badgered here; there's no knocker here, sir, to be hammered at by creditors, and bring a man's heart into his mouth. Nobody comes here to ask if a man's at home, and to say he'll stand on the door-mat till he is. Nobody writes threatening letters about money to this place. It's freedom, sir, it's freedom!" One smiles as one reads; and it adds a pathos, I think, to the smile, to find that these are records of actual experience. The Marshalsea prison was to Mr. Dickens a haven of peace, and to his household a place of plenty. Not only could he pursue his career there untroubled by fears of arrest, but he exercised among the other "gentlemen gaol-birds" a supremacy, a kind of kingship, such as that to which Charles Lamb referred. They recognized in him the superior spirit, ready of pen, and affluent of speech, and with a certain grandeur in his conviviality. He it was who drew up their memorial to George of England on an occasion no less important than the royal birthday, when they, the monarch's "unfortunate subjects,"--so they were described in the memorial--besought the king's "gracious majesty," of his "well-known munificence," to grant them a something towards the drinking of the royal health. (Ah, with what keen eyes and penetrative genius did little Charles, from his corner, watch the strange sad stream of humanity that trickled through the room, and may be said to have smeared its approval of that petition!) And while Mr. Dickens was enjoying his prison honours, he was also enjoying his Admiralty pension, which was not forfeited by his imprisonment; and his wife and children were consequently enjoying a larger measure of the necessaries of life than had been theirs for many a month. So all went on merrily enough at the Marshalsea. But even under the old law, imprisonment for debt did not always last for ever. A legacy, and the Insolvent Debtors Act, enabled Mr. Dickens to march out of durance, in some sort with the honours of war, after a few months' incarceration--this would be early in 1824;--and he went with his family, including Charles, to lodge with the "Mrs. Pipchin" already mentioned. Charles meanwhile still toiled on in the blacking warehouse, now removed to Chandos Street, Covent Garden; and had reached such skill in the tying, pasting, and labelling of the bottles, that small crowds used to collect at the window for the purpose of watching his deft fingers. There was pride in this, no doubt, but also humiliation; and release was at hand. His father and Lamert quarrelled about something--about what, Dickens seems never to have known--and he was sent home. Mrs. Dickens acted the part of the peacemaker on the next day, probably feeling that amid the shadowy expectations on which she and her husband had subsisted for so long, even six or seven shillings a week was something tangible, and not to be despised. Yet in spite of this, he did not return to the business. His father decided that he should go to school. 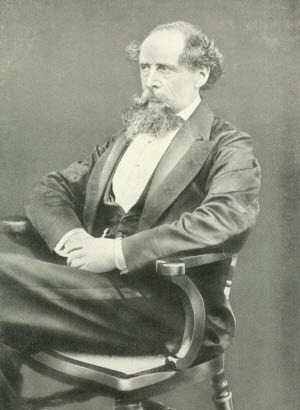 "I do not write resentfully or angrily," said Dickens, in the confidential communication made long afterwards to Forster, and to which reference has already been made; "but I never afterwards forgot, I never shall forget, I never can forget, that my mother was warm for my being sent back." The mothers of great men is a subject that has been handled often, and eloquently. How many of those who have achieved distinction can trace their inherited gifts to a mother's character, and their acquired gifts to a mother's teaching and influence. Mrs. Dickens seems not to have been a mother of this stamp. She scarcely, I fear, possessed those admirable qualities of mind and heart which one can clearly recognize as having borne fruit in the greatness and goodness of her famous son. So far as I can discover, she exercised no influence upon him at all. Her name hardly appears in his biographies. He never, that I can recollect, mentions her in his correspondence; only refers to her on the rarest occasions. And perhaps, on the whole, this is not to be wondered at, if we accept the constant tradition that she had, unknown to herself, sat to her son for the portrait of Mrs. Nickleby, and suggested to him the main traits in the character of that inconsequent and not very wise old lady. Mrs. Nickleby, I take it, was not the kind of person calculated to form the mind of a boy of genius. As well might one expect some very domestic bird to teach an eaglet how to fly. The school to which our callow eaglet was sent (in the spring or early summer of 1824), belonged emphatically to the old school of schools. It bore the goodly name of Wellington House Academy, and was situated in Mornington Place, near the Hampstead Road. A certain Mr. Jones held chief rule there; and as more than fifty years have now elapsed since Dickens' connection with the establishment ceased, I trust there may be nothing libellous in giving further currency to his statement, or rather, perhaps, to his recorded impression, that the head master's one qualification for his office was dexterity in the use of the cane;--especially as another "old boy" corroborates that impression, and declares Mr. Jones to have been "a most ignorant fellow, and a mere tyrant." Dickens, however, escaped with comparatively little beating, because he was a day-boy, and sound policy dictated that day-boys, who had facilities for carrying home their complaints, should be treated with some leniency. So he had to get his learning without tears, which was not at all considered the orthodox method in the good old days; and, indeed, I doubt if he finally took away from Wellington House Academy very much of the book knowledge that would tell in a modern competitive examination. For though in his own account of the school it is implied that he resumed his interrupted studies with Virgil, and was, before he left, head boy, and the possessor of many prizes, yet this is not corroborated by the evidence of his surviving fellow pupils; nor can we, of course, in the face of their direct counter evidence, treat statements made in a fictitious or half-fictitious narrative as if made in what professed to be a sober autobiography. Dickens, I repeat, seems to have acquired a very scant amount of classic lore while under the instruction of Mr. Jones, and not too much lore of any kind. But if he learned little, he observed much. He thoroughly mastered the humours of the place, just as he had mastered the humours of the Marshalsea. He had got to know all about the masters, and all about the boys, and all about the white mice--of which there were many in various stages of civilization. He acquired, in short, a fund of school knowledge that seemed inexhaustible, and on which he drew again and again, with the most excellent results, in "David Copperfield," in "Dombey," in such inimitable short papers as "Old Cheeseman." And while thus, half unconsciously perhaps, assimilating the very life of the school, he was himself a thorough schoolboy, bright, alert, intelligent; taking part in all fun and frolic; amply indemnifying himself for his enforced abstinence from childish games during the dreary warehouse days; good at recitations and mimic plays; and already possessed of a reputation among his peers as a writer of tales.